[work in progress] – the names are listed in no particular order. I apologize in advance for any forgotten name. Please get in touch to let me know. *NEW – The blog is open to external contributions. I’ll be more than glad to host your article(s) or other contributions related to the subject of this website. Write me an e-mail and we’ll talk about it. Cultural Association Livorno delle Nazioni. Seamless collaboration. Lisa M LILLIE, MA History, PhD Candidate at Washington University-St Louis. See her 2 panels and her abstract for the RSA 2012 Annual Meeting. Stefano VILLANI, Assistant Professor at the University of Maryland, Associate Professor, Department of History, University of Pisa, Mellon Postdoctoral Research Fellow at the Folger Shakespeare Library, PhD History Scuola Normale Superiore of Pisa. Click here for a list of publications. Mathieu GRENET, Mellon Postdoctoral Research Fellow at Washington University-St Louis, PhD History European University Institute of Florence. Click here to access some papers that he kindly allowed to post and share on this blog. Giacomo LORENZINI, Professor of phytopathology at the University of Pisa, Department of Agricultural Sciences. One-year project + conference + book about the vegetation of the old English cemetery of Livorno and restoration projects. Stella MONTANARI, Barbara ALLEGRANTI & Sante LESTI, Scuola Normale Superiore (SNS), Pisa. Collaboration on the Mayer family network for the workshop “Cartography and Cadastral Maps” within the ENArC project. Hélène KOEHL, University degree in Theology and Mathematics. Research on many protestant families of Livorno, Geneva, Lyon, etc… Some of her articles are posted on this blog in the Digitized Articles page. Francesco Freddolini, Assistant Professor of Art History at the Luther College, University of Regina (Canada). Collaboration on Giovanni Baratta’s work at the Old English Cemetery of Livorno. See his latest book. Douglas R. WHITE, Professor of Social Sciences at the University of California Irvine. Research on the complexity of social networks. Check a wikipedia page about him. See the open wiki page he created for our exchanges and discussion. Gustaf FRYKSÉN, MA-student, Lund University, Sweden. Research on the Swedish consular network in 18th century Mediterranean. Ottoman Study Group at Lund University (OSLU). Michela D’ANGELO, Professor, Early Modern History at University of Messina. See her extensive bibliography on English merchants in Livorno, Malta and Messina. Diletta D’ANDREA, PhD History at University of Messina, collaboration on Gould Francis LECKIE. See one of her recent papers on the subject. In January 2012 she published her third book “Gould Francis Leckie e la Sicilia, 1801-1818” for Edizioni Scientifiche Italiane. Giulia COCO, Art Historian, collaboration on some information regarding Horace Mann for her recently published book: “Artisti, Dilettanti e Mercanti d’Arte nel salotto fiorentino di Sir Horace Mann”, Atti dell’Accademia Nazionale dei Lincei CDX, 2014, Classe di Scienze Morali, Storiche e Filologiche, Memorie Serie IX, Vol. XXXIII, fasc. 1. Heidi LÜDI, Production Manger at DHS-DSS-HLS (Dictionnaire Historique de la Suisse), research on Jean Rodolphe Vautravers. Bertel Thorvaldsen Brevarkiv, identification of several correspondants of Thorvaldsen (Ulrich, Krause, etc.). Lionel LABORIE, Post-Doctoral Project “Millenarian Networks in Enlightenment Europe: The French Connection (1685-1750)”, Camisards, French Prophets. Actarchivi, Reciprocal collaboration on genealogical research for foreigners. THREE DECKS – Warships in the Age of Sail, Sources. Iben BJURNER, research on the Dalgas family of Livorno. She’s writing a guide book about Danish residents in Italy. Gerhard STEINMEYER, research on many families of the Dutch-German community of Livorno. Aline HORNADAY, Independent Scholar, Visiting Scholar at the History Department of the University of California San Diego. Xavier PATIÑO, Institut Menorquí d’Estudis. See the article on David Causse’s translation of an Ovidian fable, published on Randa n.66. David WILLIAMS, collaboration on David and Humphrey SIDNEY’s family. See his two articles on Essex Journal 2010-2011 in PDF format. Sally HADEN, private researcher on British-Japanese glass-making (Gower family). See the program of one of her last conferences. Olga NEFEDOVA, Art Advisor-Orientalism (Museum of Islamic Art, Doha, Qatar), research on Francis LEVETT’s portraits and family. See her last book about the painter Jean Baptiste Vanmour. Colin JERMY, researcher of the Jermy family. Download a PDF of his webpage on Francis Jermy. SGG – Société Genevoise de Généalogie. I contributed to their website with annual subscriptions and a database of over 30,000 individuals. Raffaele LUISE, research about the LEFROY family. Ashley L. COHEN, Doctoral Candidate, English Department at University of Pennsylvania. Exchanged information on Richard STARKE. Anna PHILPOTT, research about the CHABOT family. Viviana CASTELLI, Historical seismologist, she contributed with some important notes from Archives and Libraries in Siena. Antonio CAMBI, research on the CASTELLI families. Nigel & Caroline WEBB, research on Samuel MEDLEY. Nancy GILLIES, research on the HENDERSON family. Fausta SAMARITANI, research on engraver and painter Guido COLUCCI (1877-1949), TULIN and HEAP families of Tunis and Livorno. Kim HANSEN, research on the MACBEAN family. Bryan BOUCHARD, research on Hylands House and Richard STARKE. See his article on Epsom and Ewell Explorer. Mathilde CORVAIA, personal research on 18th century Corsica and Livorno. Georgie Archibald HAMMEKEN, research on the consular family HAMMEKEN in Tunis. John W. McCOY, research on the DUTOIT family of Meudon, Switzerland. Alfred CELLIER, research on the BOREL and allied families. Diana BANKS, research on the families MYLREA, MAUDE, ARMSTRONG and the survivors of the Harpooner tragedy of 1816 in Newfoundland. James HARRIS, research on the BIRD, BRAME, HARRIS, CLEGG families in Livorno, Genoa, etc. 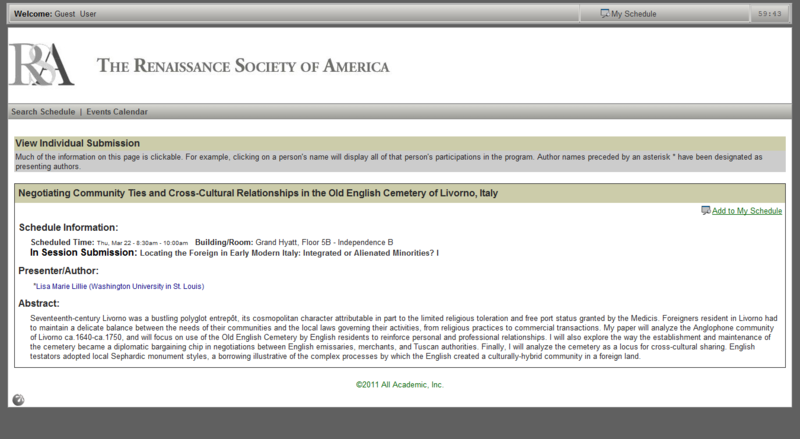 Margot BRENNAN, research on the RAE family of Livorno and Lucca. Mark RAE, research on the RAE family of Livorno and Lucca. Jeremy ENSOR, research on the De NORMANN and WOOD family. Nadia GIRAUD, research on the consular ABBOTT family. Leonardo Ranieri TRIULZI, research on the TRAXLER-OTT family. Thomas BEGEROW, research on the RENNER family of Trieste and Livorno. Julian RAWES, research on the GASCOIGNE and WALWYN families. Christopher WENTWORTH-STANLEY, research on the WILKINSON family. Enrico JAMES and Stefano TRUMPY, research on the WEBB and JAMES families. Linda PANISSET, research on the consular LEVETT family. Natalie LAWTON, research on the PERKINS family. Romain ROUANET, research on the LANTHOIS family. Nils KINDGREN, research on the GRANT family. Tommaso DORE, research on the ACHARD, MacSHEEHY, DÉPERAIS families. Stephen BELL, research on the PERKINS family. Andrew THIRLBY, research on the BOEHM, FONNEREAU, DILKES families. Panaiotis GERONTOPULOS, research on the RODOCANAKIS family. Richard ROWLATT, research on the SONNINO and TERRY families. John PICKETT, research on the SAPTE family. Collin UNWIN, research on the UNWIN family. Mervyn SENN, research on the SENN family. Lillias TOHI, research on the YOUNG family. I am based in the UK with a local history research in the Derby Silk Mills, built ca 1720, reportedly based on designs originating from Piedmont. A key interest is in ‘Glover & Unwin’ supposedly silk merchants based in Livorno ca 1716 (we know of ‘Lloyd & Unwin’ ca 1727-40). Has anyone encountered ‘Glover & Unwin’, and if so, could you please supply further details ?